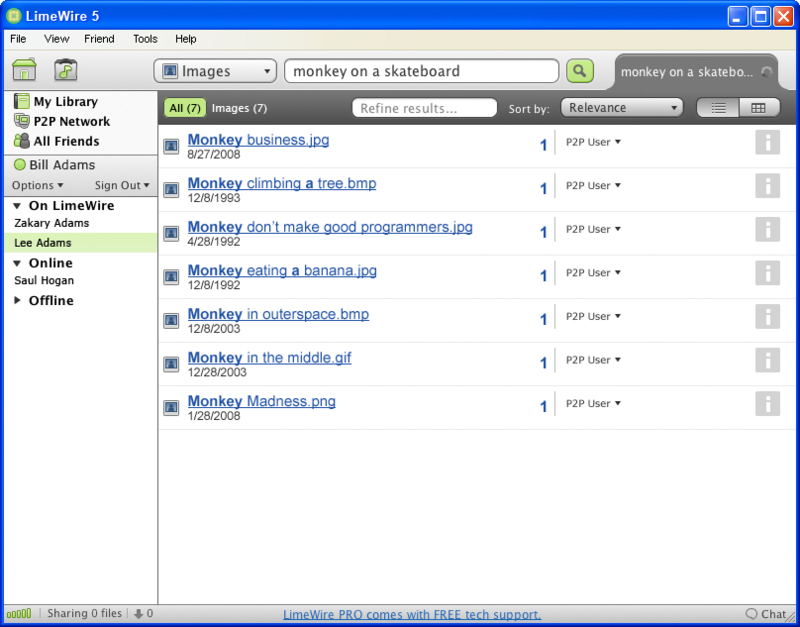 LimeWire PRO is a P2P file-sharing tool for all types of computer files, including music, video, pictures, games & text documents. Other features include dynamic querying, file previews during download, advanced techniques for locating rare files, and an easy, clean user interface. LimeWire Pro able to run on any computer with Java Virtual Machine installed. LimeWire offers the sharing of its library through the Digital Audio Access Protocol. ...... LimeWire PRO works as a UPnP Internet Gateway Device controller in that it can automatically set up packet-forwarding rules with UPnP-capable routers. LimeWire Pro's new spam blocker gets rid of junk results, and automatic updates will keep you sharing faster than ever with the latest version. You can search for Creative Commons and Weedshare licensed files, and publish your own creative works with Creative Commons licensing. LimeWire PRO continues its guarantee of no adware or spyware. Includes built-in bittorent support. LimeWire PRO Free offers the sharing of its library through the Digital Audio Access Protocol (DAAP). As such when LimeWire PRO is running and configured to allow it, any files shared will be detectable and downloaded on the local network by DAAP-enabled devices. The LimeWire PRO program enables access to the Gnutella file-sharing network. Qweas is providing links to LimeWire PRO 5.5.14 as a courtesy, and makes no representations regarding LimeWire PRO or any other applications or any information related thereto. Any questions, complaints or claims regarding this application LimeWire PRO 5.5.14 must be directed to the appropriate software vendor. You may click the publisher link of LimeWire PRO on the top of this page to get more details about the vendor.